In an effort to reduce response times during the winter commercial fishing season, the U.S Coast Guard is making good use of a “forward operating location” in Cold Bay. 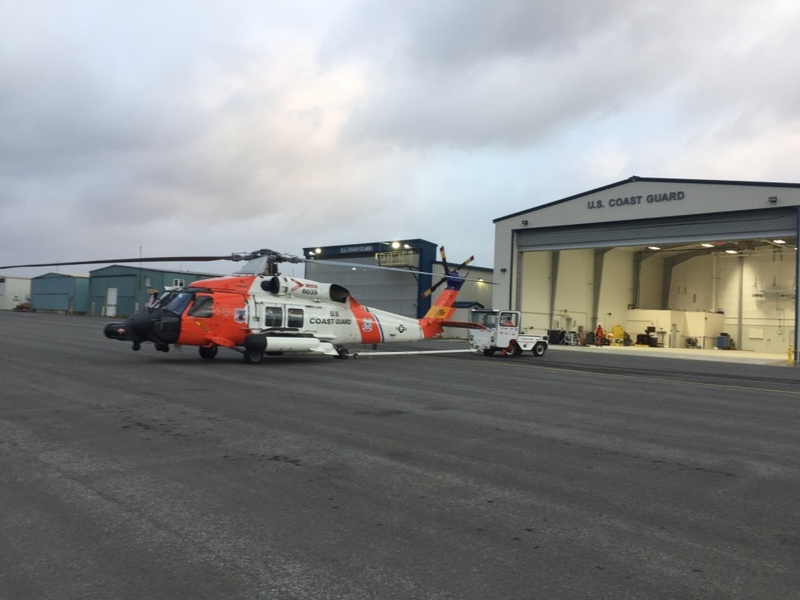 It was a busy week for the U.S. Coast Guard, 17th District Alaska, as they rescued a total of 4 maritime workers from various fishing vessels in the Cold Bay area this week. On January 23rd, a Coast Guard Air Station Kodiak MH-60 Jayhawk helicopter crew (forward deployed to Cold Bay) medevaced two men from two different fishing vessels in one heroic trip. A 21-year-old man aboard F/V Ocean Peace was suffering from sea sickness and loss of consciousness when watchstanders at the 17th Coast Guard District command received the call. Seasickness is a common issue for seamen and fishermen, and the dehydration that accompanies it can be very serious. The Jayhawk helicopter crew hoisted the 21-year-old man at approximately 5 p.m., then picked up a 37-year-old man with a hip injury from the F/V Northern Patriot. Both men were safely transported and received medical treatment. On January 24th, a 42-year-old man was medevaced from the F/V Golden Alaska, as he was suffering from a hernia. The Coast Guard duty flight surgeon recommended the man receive surgical care within eight hours. Hernias are a common injury among fishermen due to the heavy lifting associated with the job. If not properly treated, this condition can sometimes result in a strangulated hernia, which can become life-threatening. This happens when the small intestine pushes through the abdominal muscles and the surrounding muscles cut off blood supply to the intestine. When strangulation occurs, it can lead to gangrene, shock, and even death. And finally, on January 28th, a U.S. Coast Guard MH-60 Jayhawk helicopter crew medevaced a fisherman from F/V Ocean Rover. The 59-year-old man was suffering from abdominal pain, and was transported to Cold Bay and then Anchorage for emergency medical care.